It had an ND filter on it which she didn't like so a friend tried to get it off with pliers which is why it has the indentations to the focus ring and scratches as seen in the pics, it works perfectly and doesn't notice but it is there so I wanted to point it out. 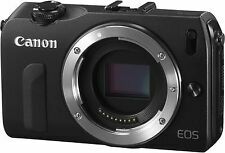 Canon EOS M50 Compact System Camera & EF-M 15-45 mm f/3.5-6.3 IS STM Lens NEW. Condition is New. Dispatched with Royal Mail 1st Class. Compact, sleek and intuitive shooting experience. Change your lens to change your view. Select from the compact yet versatile EF-M lens range or access the huge choice of EF and EF-S lenses using optional Mount Adapter EF-EOS M. Easily back up your images to cloud services Versatile wide-angle zoom lens for shooting everything from wide-angle landscapes to portraits with beautiful background blur. Equipped with SCHOTT 720nm Infrared Filter. EF-M 15-45 mm f/3.5-6.3 IS STM Lens - Black. EF-M 15-45mm f/3.5-6.3 IS STM Lens. 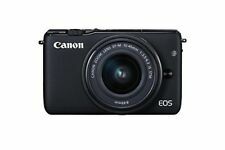 Canon EOS M50. 2.36m-Dot OLED Electronic Viewfinder. DIGIC 8 Image Processor. Key Features. Équipé du filtre infrarouge SCHOTT 720nm. Series Canon EOS. Model EOS M. Custom Bundle No. Type Mirrorless Interchangeable Lens. MPN EOS-M-720-BLCK. Modified Item Yes. EOS M3: Key Features. Hybrid AF system (6.1x faster than the EOS M). With a compact, lightweight and stylish body that’s a pleasure to carry, the EOS M3 puts all the power of a DSLR, complete with interchangeable lenses, right by your side. EOS M3 : Les principales caractéristiques. Changez votre objectif et voyez le monde d'un point de vue différent. Monture d’objectif EF-M. Voir nos catégories. Commandes ergonomiques, manuels. Assist créatif. CANON EOS 200D Compact, simple et polyvalent : un appareil photo en phase avec votre quotidien. Le mode Autofocus CMOS Dual Pixel garantit quant à lui la mise au point avec visée par l'écran la plus rapide au monde. Create impressive stills or full HD video with its 24.2-MP CMOS sensor and transfer them easily to your devices or the web via Bluetooth or Wi-Fi. Its interchangeable lens system opens up new worlds of photographic creativity. When used with the EF-M 1545mm f/3.5-6.3 IS STM lens, the autofocus area includes up to 99 AF points within an 80% x 80% range, and can be expanded up to 143 AF points to cover an image area of approx. Specs: Canon EOS M10. Lens mount Canon EF-M. Nous croyons que tout peut être résolu par la communication! Focal length multiplier 1.6×. La quantité de pixels morts à l'écran est égale ou supérieure à 9 malgré l'endroit où ils se trouvent. EOS integrated cleaning system. File Numbering. (1) Consecutive numbering. Picture Style Editor, EOS Utility, Image Transfer Utility. MF Peaking available. RAW: RAW (14bit, Canon original RAW 2nd edition). You can quickly select focus points with the vari-angle Live View touchscreen. With built-in WiFi, Bluetooth and NFC technology, the EOS 77D makes it easy to stay connected. You can share your images and movies on social networks with ease, allowing the world to share your imagination. Appareils photo numériques > Canon >Canon EOS M100 noir. Canon EOS M100 noir. Modèle Canon EOS M100. Couleur noir. • Actif depuis 2008 avec maintenant plus de 120 collaborateurs à votre service. • Votre vendeur N° 1 pour l'éléctronique grand public reconditionnée. With built-in WiFi, Bluetooth connectivity and NFC technology, you can easily connect the EOS 800D to your smartphone or tablet. Focus area points9-point autofocus. SCREEN & VIEWFINDER. TypeOptical viewfinder & Live View. Appareils photo numériques > Canon >Canon EOS M10 noir. Canon EOS M10 noir. Modèle Canon EOS M10. Couleur noir. État de l'appareil reconditionné: Très bon. • Un large choix d'appareils reconditionnés: smartphones, tablettes, appareils photo numériques, objectifs et plus encore. When great quality results are the most important thing, the EOS 800D makes it simple to capture photos and movies you’ll be proud of. Next-generation technology is easy to use, and improves performance in low-light and when shooting movies. Item model number: M50. Compact, sleek and intuitive shooting experience. Why Buy From BirdOnAWire?. Inspiring technologies for stories you'll be proud of. Canon EOS M3. Autofocus locks on quickly and confidently for pin-sharp results. It is versatile with interchangeable lenses. Be as hands on as you like, with the range of creative modes. Enhanced image quality, even in low light, from a 24.2 MP DSLR-type sensor.